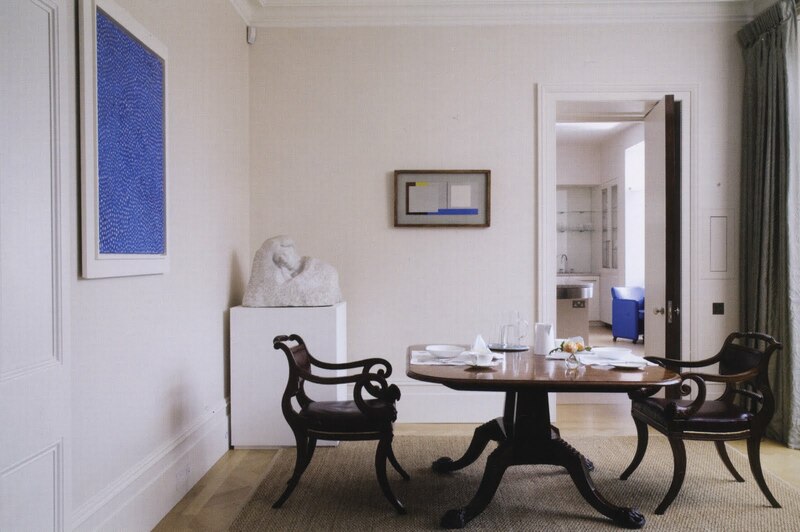 The breakfast area of a London dining room decorated by David Mlinaric, circa 2007. Image from "Mlinaric on Decorating" by Mirabel Cecil and David Mlinaric (Frances Lincoln Limited, 2008). Simplicity is something I've never been much good at achieving, particularly when it comes to outfitting a room. The reductive results either look impoverished or impractical. But if I could achieve the same spare, bold, hushed atmosphere embodied by the picture above, in our house or our apartment, I think I might come close to true happiness. The Platonic serenity of this image is resolutely modern but also strangely classical, a functional space furnished for the bare minimum of activity and raked by cold, unforgiving light. (Not for nothing was this 19th-century structure in Chelsea the former studio-residence of artist John Singer Sargent, for whom northern light was crucial in the production of his portraits.) It has something of the calm clarity of the paintings recently shown in "Rooms with a View: The Open Window in the 19th Century," the Metropolitan Museum of Art's exhibition of depictions of sunlit European rooms, especially the works of German artist Georg Friedrich Kersting. The room seems empty but is actually quite full, furnished with honest materials spanning the poles of light and dark—curtains of silk the color of fog; plaster stippled an even more evanescent shade of grey; satiny marble; seats of supple leather; a carpet of woven sea grass; and polished mahogany chairs with cornucopiae supports. That exuberant last-named detail, the horn of plenty, is an eccentric chair element though so fitting in a room for meals. I am also keenly appreciative of the lack of overt decoration, a paucity that demands one heed the person opposite and what he or she is saying (or not saying), as coffee is poured and toast is buttered; this is a no-nonsense spot, a place where one cannot hide, where extended silences would be considerably awkward. It contains but it does not cosset. Of this atmosphere I wholeheartedly approve, since a room's decoration, to my mind, should never subsume its occupants. One must admit, however, that this particular photograph is taken out of context. It is not the small room it seems but instead the breakfast-area end of a spacious dining room in the London residence of financier Sir Evelyn de Rothschild, shaped by Theis + Kahn Architects and interior designer David Mlinaric. The now-relatively-retired founder of Mlinaric, Henry & Zervudachi is a decorator so brilliant the septuagenarian really should be knighted, though the CBE he received in 2009 "for services to interior design and to heritage" is not to be sniffed at. Consider, for instance, the superb asymmetrical siting of the art here, notably Auguste Rodin's Le Sommeil (one of three marble versions) pushed firmly and idiosyncratically into its corner. There the sleeping woman—a gift from the artist to his American-born last mistress, Claire de Choiseul—commands attention and yet, because of her smoky-white complexion, she seems to fade into the grey wall along with the resolutely plain plinth. 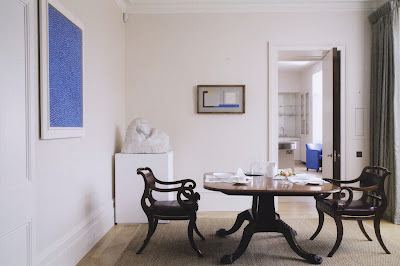 And what about that pulsating thread of vivid blue connecting the Yayoi Kusama abstract on the left to the Ben Nicholson canvas on the right to the armchair in the kitchen beyond? Subtly handled, I'd say, and highly deliberate. To me, this sliver of tailored space embodies everything Mlinaric once said about his approach to fashion, according to an interview posted on the website of the Victoria and Albert Museum: "I always quite liked being smart, tidy and clean and trim." To that, I'll raise a glass. NB: Other blogs have previously posted images of Sir Evelyn and Lady de Rothschild's London residence, namely Cote de Texas in 2009 and Brilliant Asylum in December 2007. A large article about the house was published in the January 2008 issue of W.